Welcome to Kenneth Zund Realty Associates Inc. Thank you for taking the time to inquire about the services of our firm. More than likely, you’ve come to our website because your New York City commercial real estate requirements need to be addressed. 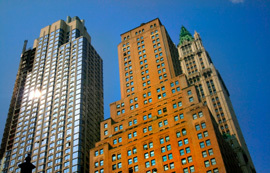 Whether you wish to lease or buy office space, retail space or any other type of commercial space or property in New York City, or are looking to buy or sell commercial investment property, Kenneth Zund Realty Associates, Inc. is poised to be your New York City commercial real estate partner. Serving clientele throughout New York City, with particular focus and expertise on Manhattan and each of its sub-markets, we offer comprehensive solutions and counsel with respect to your New York City commercial real estate lease, purchase or disposition requirements. Since 1985, we have assisted hundreds of local, regional and national corporations, professionals, organizations and institutions to relocate to more suitable space, dispose of surplus or underutilized space or to renew, restructure, extend or expand existing lease commitments within New York City. Looking to the future, we believe that the fundamental role of the commercial real estate broker will be to bring together the confluence of experience, technology, information and personal relationships within a single transactional platform in order to best serve the needs of the client.